I love emotionally charged political thrillers, so when the author reached out to me, requesting a review, I almost immediately said yes. I went in with a lot of expectations, and for the most part, this book didn’t disappoint. Justice Gone has 4 parts to it–the initial crime, the second crime in retribution to the first, a court trial, and the resolution. Jay Felson, a homeless war vet is beaten to death for “loitering” by police officers. After a public outcry, the cops are suspended with pay. But three of these cops are shot to death by someone and a nation-wide manhunt begins to bring the cop-killer down. This has all the makings of a novel I’d love. And this story will hit any American too close to home, seeing as how it tackles issues such as police brutality and racial profiling. While there are plenty of characters in this novel, most of them are key to moving the story forward. The courtroom drama that follows is my favourite part of the book. Until then, the writing is all about setting the scene. I don’t know if it’s my love for courtroom dramas talking, but I’d have loved it if there was less of the scene-setting and more of the finale. That’s where Lombardi’s strong suit is and I would certainly eat up any legal drama he writes in the future. Read this book if you like political thrillers, courtroom drama, and books that hold a mirror up to the state of the world as it is. 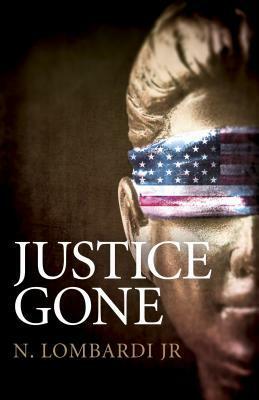 Justice Gone releases on February 22nd, 2019. Preorder it today. Previous Post A Q & A with Markus Zusak ft. book thieves, bloggers, and balderdash. Next Post The longlist for the Swansea University International Dylan Thomas Prize is here!